Survival team building will be helpful and maybe even vital if you find you must survive an apocalyptic event. An apocalypse can take many different forms, and having a team of people with varied skills and ideas before, during and after the event can help immensely. The best time to start building a team is right now. The first thing you can do to find a group of like-minded people is to talk to your friends and family. Explain that you are trying to build a team of people to help each other survive if an apocalypse occurs. Many friends and family members may have skills about which you never knew that could be very helpful, or they may be closet preppers, people secretly preparing for the apocalypse. The next step is to start advertising online. The Internet makes it very easy to connect with like-minded people for the purposes of survival team building. Posting ads on Craigslist or other websites is an excellent way to build survival groups. In the ad, explain clearly and coherently what you are trying to do and request that interested parties contact you. 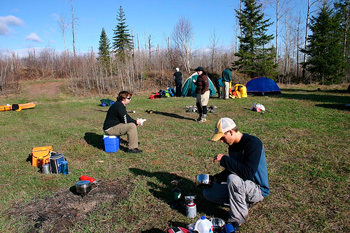 When you are survival team building, It is best to keep membership in the group local since you may not have a reliable way to connect with the group members once an apocalyptic event occurs. Many message boards, including Craigslist, have city-specific sections where you can post ads. Your local newspaper may also have places where you can run ads. If your neighborhood has a newsletter, you may also be able to put in ads or you can put ads up at local coffee shops and other businesses. While you are looking for members of your survivalist group, pay special attention to the skills of your various group members. Some skills are particularly important but it may be difficult to find people with those skills. For example, you will absolutely need a member with medical skills, such as a nurse or doctor. An additional benefit to having those people in your group is that they can teach other group members. Once you find a survival team, you may find it helpful to organize your group through websites like Meetup or Yahoo Groups. These sites allow you to easily post information that everyone in the group can see, exchange messages and plan in-person meetings. Once you have assembled a group, the group will need to meet in person. You can meet at someone's home or at a local park or coffee shop. Meeting in person will make it easier to talk and exchange ideas as well as learn skills from each other. When you meet with your survivalist group, you will have lots of work to do. You will need to make a plan about how to store and stockpile food and necessary supplies. You will also need to find a way to ensure that you have access to those supplies. Establishing a shelter is a good idea. You will also absolutely need to come up with a plan about what each member needs to do in the event of an apocalypse. During group meetings, members with helpful skills can help train the other members. If nobody in the group has a necessary skill, either you can take classes as a group to develop that skill or one person can take classes and become an expert and then teach the rest of the group the relevant parts that they learned. Survival team building is an important and very helpful aspect of preparing for the apocalypse. It allows you learn new skills and pool your resources and knowledge with other like-minded people.